Are there additional enforcement procedures that could be employed by the Metropolitan Police and United States Park Police to deter congestion-causing traffic offenses? Are there any planned or potential expansions of bus parking spaces or drop-off lanes in the Mall area? Are there steps that can reasonably be taken to increase visitors’ use of Metro and satellite bus parking, including advertising through National Park Service materials or the DC Visitors Bureau? Can the Park Service coordinate tour times so as not to coincide with peak commuter rush hour periods? If I had to guess, there’s a lot that can be done to increase enforcement against the buses that are causing the problems. I’d advocate for a $500-$1,000 fine, myself, and maybe public floggings of the drivers that are repeat offenders. This entry was posted in: News, The Daily Feed, Tourism, WTF?! Why is a US Senator asking the mayor of DC about what NPS can be doing to step up enforcement? NPS is part of the Department of the Interior, which is a federal executive branch. Hey Smart Guy. 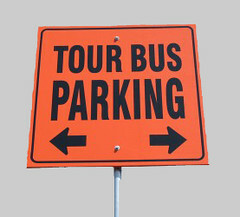 There is a $500 motorcoach fine for double parking or parking in any area that is not marked tour bus parking. But I tell all you DC hero’s what, why don’t we just tell all the tour buses “don’t come here anymore”. That way every person on that tour bus will have to drive their car into the city. That is 55 cars per bus. Then let’s see what Jimmy has to say from his desk up on the hill. The Gulf is filling up with oil and this idiot is worrying about buses bringing millions of dollars to the DC area.